Looking for an authentic New England farm experience this fall? Red Apple Farm in the North Central Massachusetts town of Phillipston is a fabulous place to pick your own apples--and so much more. You'll be greeted by a friendly, well-trained staff member when you arrive, and on weekends in September and October, your first order of business should be to hop aboard a hayride for a tour of this 67-acre, fourth-generation, family-owned and lovingly preserved farm. You'll get a sense of all there is to do at this agrarian outpost--from feeding farm animals to exploring hiking trails--and gain an appreciation for the energy owners Al and Nancy Rose and their four children pour into sustaining this hilltop orchard and farm. Speaking of energy, you'll also see the 15 kW wind turbine and 10 kW solar panels that provide all of the farm's electricity. Since they now rely solely on environmentally friendly wind and solar power, "We joke about changing the name to 'Green Apple Farm,'" Al reveals. Admission to Red Apple Farm is free. As of 2013, hayrides are 3.75 per person for ages 4 and up. 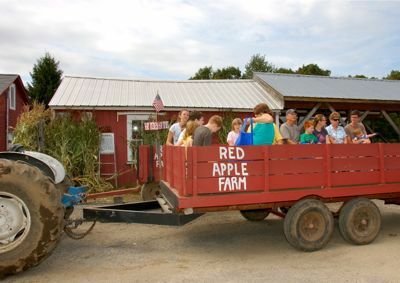 My family and I visited Red Apple Farm on an early September Sunday in 2011, and on this photo tour, I'll show and tell you about our favorite family adventures at the farm. Al Rose's grandfather founded Red Apple Farm in 1912 as a wholesale apple grower. Al's father made the prescient decision to transform the property into a retail operation. "Our business has changed from selling apples to selling an experience," Al says. In the fall, picking apples is still central to that experience, and Red Apple Farm's planting strategies and location at 1,250 feet above sea level make it one of the longest-producing orchards in New England. Red Apple Farm offers more than 50 varieties for picking, from historic varieties like Baldwin to traditional favorites including McIntosh and Macoun to relatively new types of apples such as Ginger Gold. Apple picking begins at Red Apple Farm in late July and typically runs all the way until October's end, when the Winter Banana apples are ready for picking. In 14 years of covering fall in New England, my family and I have had plentiful opportunities to pick apples and pumpkins. But digging our own potatoes? That was something we'd never seen, and my husband couldn't resist the chance to cross the experience of harvesting potatoes off his bucket list. He and my daughter listened intently as a staff member explained the procedures. Then, they used potato rakes to uncover beautiful red potatoes that were delicious when we fried them up at home. An added bonus: My daughter learned--as many city slickers do when they visit Red Apple Farm--that potatoes grow underground. Digging potatoes is a popular activity for school groups that visit Red Apple Farm. The list of made-in-Massachusetts specialty food products we had the chance to sample at Red Apple Farm will make you drool: cider donuts, apple dumplings, homemade fudge, fruit-topped ice cream, caramel apples, apple cider, maple cotton candy. And that was all after a scrumptious barbeque lunch! The one product we brought home that we absolutely can't stop raving about may surprise you. Honey-roasted, slightly chunky, fresh ground peanut butter made at the farm in this old-fashioned peanut butter machine. Just a week after our visit, my daughter was already insisting: "We have to go back to the farm to buy more peanut butter." When we beheld the Giant Pumpkin Patch at Red Apple Farm, my instant reaction was to look for Linus. If you recall the plot of It's the Great Pumpkin, Charlie Brown, you'll know that I believed I'd stumbled upon the sincerest of all pumpkin patches. Red Apple Farm has 8 acres planted with pumpkins, and unlike some farms where pumpkins are trucked in and scattered across a field in the fall, Red Apple Farm's healthy, orange specimens are still growing on the vine, so you can enjoy a true pumpkin harvesting experience. We even saw a pumpkin that had reached an estimated 300 pounds--and still growing! I've already mentioned all of the tasty products sold at Red Apple Farm's store, but I'd be remiss if I didn't specifically counsel you not to miss the bakery's apple dumplings and sugary cider donuts, which are a treat at home but to die for when you eat one fresh and warm from Red Apple Farm's donut fryer. We had the chance to go behind the scenes to see the kitchen crew hard at work cranking out these tender donuts, made with the farm's own fresh cider. When Red Apple Farm's Philliptson, Massachusetts, location is closed in the winter months, you can still satisfy your cider donut cravings at Wachusett Mountain's Bullock Lodge Cider House while you're on the slopes. On weekends from Labor Day through the end of October, Red Apple Farm adds outdoor barbeque dining to its line-up of enticements for day trippers. The grills don't just turn out run-of-the-mill fare, either. The pulled pork, for example, is slow-smoked on site. My husband and I agreed to split grilled chicken and pulled pork sandwiches. When it came time to make the swap, he was reluctant to relinquish the pulled pork. Once I'd tried a bite, though, I wasn't giving it back! Not only is the pork a treat, orders of French fries are huge, and these crisp, golden fries taste snappy with malt vinegar on an autumn day. Pour yourself a sample glass of Red Apple Farm's 100% natural apple cider, and you'll be hooked. One of owner Al Rose's dreams for the farm's future is to collaborate with Gardner Ale House to introduce a line of hard ciders made with fruit from the farm. The Sidral Mundet apple sodas served at Red Apple Farm aren't made in New England. They're imported from Mexico, where the farm's owner, Al Rose, was raised. Still, you don't want to miss these sweet-tart beverages, which we haven't encountered elsewhere and which are the ideal refreshment on a sunny New England fall day. The green apple flavor is particularly appealing. Red Apple Farm owner Al Rose's grandfather studied pomology--the science of fruit growing--and, in 1912, he planted this McIntosh tree, which is unlike any other you'll see. The Sir Isaac Newton Tree is the oldest commercially planted McIntosh apple tree in New England, says Rose, and that likely makes it the oldest in the country. Photos of the farm's founder at work on the property hang in the farm store. Ask an employee to point them out. In 2012, this sprawling, stalwart, historic tree was celebrated at a 100th birthday party. The Johnny Appleseed Tree is also intriguing to see. Through grafts, there are about 60 varieties of applies growing on this single tree. Ready to plan your own fall outing to Red Apple Farm? Set your GPS for 455 Highland Avenue, Phillipston, Massachusetts. It's 1-1/2 hours from Boston or Hartford, 2-1/2 hours from Albany. While fall is the farm's busiest season, you can also pick your own blueberries in July, pick peaches in August, attend the annual Thanksgiving Harvest Festival in November and shop for holiday gifts during the Country Roads Christmas tour in December. For up-to-date information on what's picking and the farm's operating schedule, visit the Red Apple Farm Web site or call 978-249-6763 or toll free, 800-628-4851.